The Book of Mormon ends with the destruction of the Nephites — what has been referred to as the Nephite Apocalypse. That part of the story starts when Mormon enters the scene when he is fighting with an army of 30,000 men. As the war goes on, he withdraws from leading his people, and then is pressed back into service when they scour the landscape and press raw levies into a force of 24 legions that is broken in the last battle. Assuming the battle is recorded like any other battle of its time, the same as other historical records, what actually happened in this last battle? First, the Nephite elites lost. They are a small minority (it is significant to Mormon that he is a descendant of Nephi – a status which is apparently remarkable)(Nephite is used in two different ways throughout the entire book. One is for a small group that is descended from Nephi and Sam. The other for anyone who is allied with them). Second, their forces were “destroyed.” Following which the wars continued without them (as noted in the text) and the surviving Nephites were hunted down and killed as a sideshow to the ongoing wars. Well, my thought is that it is fair to look at how similar stories from the same time periods were told in other historical writings. I’ll start with the Greeks. Historically, a Greek phalanx that was “destroyed” had taken 5% casualties in the hoplite era and lost unit cohesion and the battles rarely lasted more than an hour, start to finish. Cf https://en.wikipedia.org/wiki/Ancient_Greek_warfare. Raw levies (military units formed of relatively untrained troops) broke and scattered with less pressure than a hoplite phalanx. (for more on the levy system, https://en.wikipedia.org/wiki/Levy )(and see http://biblehub.com/topical/l/levies.htm ). They were “destroyed” when they lost cohesion, often with far less than the 5% casualties that it took to break a hoplite army, and after a far shorter clash. When you read of Caesar’s intervention against Usipetes and Tencteri where with a legion or so he destroys hundreds of thousands of Germanii, you are reading about trained troops going against raw levies. The same is true of Xerxes marching against the Greeks with around 200,000 men when his army was broken by 40,000 hoplites. It is interesting to look at military units that are called “ten thousand” or a variant on that. It also helps to look at other historical accounts of how many were in a battle and recreations where the actual number is calculated. Consider the 732 A.C.E. Battle of Tours where 400,000 Umayyad and 75,000 Franks were said to have participated according to records from the 700s. Chroniclers later claimed that Charles Martel’s force lost about 1,500 while the Umayyad force was said to have suffered massive casualties of up to 375,000 men. Modern historians put the number of Umayyads entering the battle at closer to 50,000 and with less than 20% being killed. https://en.wikipedia.org/wiki/Battle_of_Tours. Following up on that example, the actual number in a “century” varied a great deal https://en.wikipedia.org/wiki/Centuria#Military. The longer the war, and the worse the conditions of the nation, the smaller the number in a century or a legion. As a result, a unit called a “ten thousand” could have three thousand men or fewer in it. There are a number of historical examples of extreme shrinkage. Besides fighting over territory, just who where the opposing sides fighting and who were they attacking. Generally, in a battle of this type, the peasants (or equivalent) are a resource. The enemy leaders are the target. That has been true even down to today in some conflicts where the officers were killed and the enlisted personnel enrolled in the mass of the winning army. It is probable, in my opinion, that the target of this conflict was the Nephite[family] elite not the Nephite[faction member] peasants. That is consistent with their enemies hunting down and killing those who fled while the larger war between the enemy factions continues unabated. That is also consistent with having a reason to fight that makes sense in a historical context. 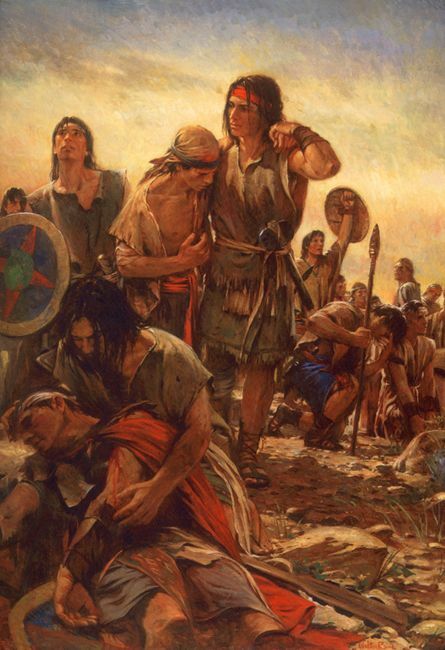 The Nephite army may have numbered as many as 72,000 men (up from its original strength of 30,000 under Mormon at the beginning of the war) broken into 24 units led by the Nephite elites. Total casualties they suffered, if this was a battle typical of a clash involving raw levies, would be less than 2,000 – but would be disproportionately the leaders and elites involved, more than enough to destroy the Nephites as a power base (and note that the Book of Mormon reflects that the wars continue without the Nephites once they are slaughtered). The main battle probably lasted less than half an hour before the one side broke and fled, leaving the elites to be slaughtered. Note that the record reflects that the elites were chased down and hunted after the battle, so that many of them appear to have successfully fled for a time. Others were slain even though they started the battle surrounded by their soldiers. My assumption is that the battle recorded is being recorded the same as similar battles at similar times involving what appear to be similar forces. Similar times: ancient era. Similar forces: mostly raw levies with some experienced soldiers spread among them. Similar writing as other historic writers in similar situations. When you read the closing acts of the Book of Mormon, you are reading of the apocalypse that destroyed the Nephite elites and their power base — the end of the story of Nephi, whose story starts the Book of Mormon. While for them it was a history ending catastrophe, it is far different when looked at from an outside perspective (and why the warring parties appear to not even have slowed down after eliminating the Nephites). Much like some of the battles against Genghis Khan. For the elites that led the forces against him and who were slaughtered, it was the end of the world. For China it was just a change in government, not even a change in bureaucracy. Worth thinking about as the Book of Mormon study period draws to an end. Next Next post: Why can’t women be Witnesses? Genghis Khan killed only the elites? And left the local populations unharmed? I don’t buy it. Granted, some of this goes against the common interpretation of the text. But its seems when reading the BoM that many prefer initial and superficial assessments, no matter or because of how ridiculous they sound instead of trying to diligently read the text and abandoning shallow assumptions of it. Long story short, I’m not really seeing your point about numbers. Big numbers are listed in the BoM, which have ample precedent in history, but many historical documents list “wrong” numbers, which has many more precedents in historical documents. There are a variety of very useful analytical approaches we can take to understanding the numbers listed in historical documents, or those purporting to be like the BoM. Demanding to know of battles in history with millions of people is not one of them. Thanks for letting me post. I love discussing the Book of Mormon. I conclude Joseph Smith and/or Mormon did not know about these demographics of ancient battles any more than I do. Your novel descriptions sound generally reasonable (with maybe the Mongol exception) and are backed up with credible sources. Your descriptions clearly contradict my understanding of the literal/traditional reading of the Book of Mormon . I am again forced to pretend that it says something it does not or else reject it. How many times do we change or refine the meaning of the scriptural text in order to make it more believable before we admit it is something else than reported? If less relevant descriptions of battles are not to be trusted then neither is the relevant doctrine. If destruction from war goes from 99% to 5% then where does universal resurrection go? The text has to stand on its own rational merits like anything else (including this blog) without the benefit of being miraculous or having the divine stamp of credibility. That is what is supposed to make it a unique book. On the way to China the great Khan slaughtered a lot of people. But in the conquest proper he displaced the government at the top while keeping the country running with the beurocracy firmly in place. I over simplified in using him as an example. Mike. The great small pox and black plagues occurred well after 600 BC. Probably explains why Lehi and family did not have them to share. Neither did the Vikings who had a colony in Newfoundland. And the Vikings were much closer in time to the plagues, etc. What would be the purpose in teaching that the Nephite slaughter was not a slaughter, but something far less dramatic? I might be able to walk with you if there was a purpose for the revisionism, but I cannot imagine any purpose. With no purpose and no evidence, shouldn’t we leave it alone and teach it as written? Jl–I’m just giving the text serious study. Had not thought about a purpose beyond treating it as a real text worth serious analysis. All. https://en.m.wikipedia.org/wiki/Mongol_invasion_of_China For more on that topics and how Chinese soldiers and generals served under the Mongols. While there is a lot of debate, this quote from Wikipedia hits the general consensus on smallpox. I have learned a great deal by looking at texts seriously (such as learning that the genocides in the Bible were narrative devices and did not really occur) and thinking about them (e.g. That Noah’s grandson divided the land with others who had a different language). I don’t see it as revision–it is learning and study. ji, I’ll venture a guess at answering your last question directed at the OP. One of the latest theories in LDS apologia is that the Nephite/Lamanite population was very small, which would somewhat mitigate the implications of the lack of DNA or archaeological evidence we currently have for the Book of Mormon. However, the number of soldiers listed in the final battles of the book (not to mention Ether, which is a whole other issue) implies a fairly sizable base population. If one were able to show that the numbers given in the book were really just names for a unit and not a reflection of fighting strength (i.e. that “a 10 thousand” could mean as little as 3,000 troops), then that pushes the actual raw sizes of the armies to a much smaller number, which would then be consistent with a much smaller base population. Personally, I don’t find those examples to be compelling. How can one place measurement standards of one culture onto another when they have been 100% isolated from each other over extreme distances and a millennia of time? The only responsible thing a student of the Book of Mormon can do is to take what it says at face value. For what it is worth, I’ve been working on variations of this analysis since the early 1980s ever since I started looking at the king men and their revolutions. “I might be able to walk with you if there was a purpose for the revisionism, but I cannot imagine any purpose. With no purpose and no evidence, shouldn’t we leave it alone and teach it as written?” Wow, this is depressing. I’m much more interested in reading an in-depth examination someone did out of personal interest than an in-depth examination crafted to further some agenda. The black plague was a disease that afflicted Europe terribly, not one that Europeans were far more resistant to in comparison to the American Indians. It was not a disease common in colonial America.That major epidemics happened in the 1300’s and 1600’s and 1800’s does not exclude more ancient outbreaks. It originated in China and it existed there deep into the past. That dog don’t hunt. The big picture is that many of these epidemic diseases originated following the Agricultural Revolution about 10,000 years ago which opened up new niches for them. The human population grew by about a factor of 50 and the density also increased because large numbers of people farmed closer together, lived for months in the same buildings with their animals, began to build cities and stopped wandering around as much. Small pox is a good example. It does not have a non-human host and it has a short incubation period of only a couple of weeks. It will not survive long in the niche of only widely scattered hunter-scavenger groups. It will do fine in cities and farming towns. Many of these epidemic diseases resemble similar diseases in farm animals (cow pox) which descended from wild prototypes (wild oxen) that lived in herds for eons and the diseases jumped species to humans. This was going on long before 600 BC (or 2000 BC for Jaredites). The Aztecs and Olmecs also invented agriculture but much more recently and much less ubiquitously. So that they did not have time for these robust epidemic pathogens to evolve to the same extent as in the Old World. The problem remains; Old World immigrants did not bring the expected diseases to the New World. Why? Either they never came in large numbers or we must come up with another explanation. The Vikings were a small group with not many years exposing others. They lived in a very cold climate which hampers travel and social contact. The Indians got lucky and wiped them out first. In retrospect, that was the only viable policy pertaining to European immigration from the Indian perspective. (Just building a wall would not have been enough). Of modern interest is the evolution of new diseases in Africa. Exploding populations of humans are putting every kind of selective pressure on all animal species. Human density is increasing. Human sexual practices are changing rapidly. Humans are eating more “bush meat.” New niches are exploding as microbial DNA is being spread ever wider. We might expect the emergence of new plagues there, such as AIDS and diseases like Ebola virus will become more virulent in successive waves of epidemics. New ones will appear. I hope the missionary department stays on top of it and I pray for the scientists at the CDC. They might be more important than the scientists who invented the atomic bomb. Mike, I’m not sure I get your point other than you think that my analysis in the 1980s is a response to recent trends and that you conflate the Black Plague and Small Pox. But it seems reasonable to me that a small group from Jerusalem could travel without bringing Small Pox with them. There is no reason to be depressed. One person says he believes that the Nephite slaughter was not as dramatic as the scripture text says but may have been just a killing of the elites. I’m intrigued. I inquire. But the original poster admits there is no direct evidence and also no needful purpose, so I decide not to adopt his belief as my own. Where is the problem? If there was evidence, or even some purpose in the absence of evidence, then I might have changed my thinking. As it is, I’m satisfied to continue thinking of the Nephite slaughter as more than just a removal of the elites, and the Book of Mormon text as adequate and reliable for its intended purposes. I think the original poster would allow me that. I never said the original poster was wrong. I think this sort of back and forth on wondering and ideas can be a healthy part of scripture study. I appreciate the original posting. The seed is forever planted in my mind. However, for the time being, I prefer to continue to look on the matter as a general slaughter. No one should be offended or depressed by this. Ji, then I misunderstood your statement. When you said, “shouldn’t we leave it alone and teach it as written?” It sounded as if you expressed disapproval that the original post was written in the first place. I don’t think Stephen is attempting to convince the correlation committee or suggesting we should be teaching this in Gospel Doctrine. It’s just a fun thought exercise. I am sorry that I am not being clear. I hope I am not being insulting. Forgive me if so. My point is complex and a blog might not be a good way to make it. It is the sort of thing you have to research and discover for yourself. I think I have a path for you and anyone else watching that might work. Understand how we came to have these epidemic diseases. They are not entirely accidents of nature. Did the Jaredites, Lehites, Mulekites collectively bring or not bring any epidemic diseases or immunity with them to the new world? Why or why not? Same question for Vikings in the 1oth century. Same question for Europeans in the 16th century. Next how many people and what conditions are needed to get at least one of these epidemics started that nearly wipes out a competing population? I am not an expert but I can read. It is not a smoking gun proof but I see a problem with the literal Book of Mormon story .I think their descendants should have conveyed far better immunity to the diseases that wiped out so many American Indians. The immune response to disease is complex involving hundreds of genes, it would have very strong selective advantages and it would not easily be lost like a few genetic haplotypes. I think this indicates that the primary ancestors of the American Indians NEVER did live in a culture that adopted the agricultural revolution and were nearly completely isolated from it all the back to the monkeys and beyond. This is supported by current anthropological understanding of their origin. I think of it in some ways as similar to the DNA problem except it is the DNA of microbes that is transmitted more rapidly and the associated DNA of human immune response. It is additive to the more famous genetic DNA problem and much more difficult to explain away. Another problem it appears to me to worsen is the problem of numbers . We need small numbers for some parts of the story to make sense (lost DNA) and we need large numbers for other parts to make sense ( battle losses and influence). We can’t have it both ways depending on which problem we are considering in isolation from the others. This lack-of-resistance-to-disease problem forces us to a very small and entirely healthy founder population and one that transmits extrmely poor genetic immunity to the common diseases in their lands of origin. It magnifies the problems of numbers that caused Hugh Nibley to think that thousands of Lehites et.al. had to have migrated to the new world. ( Can’t find the source for that right now) Of course, Nibley was smart but not invincible and has proven to be wrong on other things. And being far less intelligent, I could be wrong on this one.